Impact Sports Promotions has a variety of designs available in polo shirts. These make for an excellent addition to your club or team uniform. They are also ideal to be worn for training, or something to be worn when travelling to and from practice. Our polo shirts are Australian made, and are an excellent choice of apparel for your club or team. Also popular for corporate events or trade shows. Our polo shirts are available in a variety of styles. We have the set in sleeve style, or the raglan sleeve style. You can choose from these designs and styles for range of sports, or we can help to create something custom. Call us today on 03 9879 4111 or Email us and we will be happy to assist. A polo sports shirt is an excellent, versatile option for athletes both on and off the field. From training needs to the perfect way to show team spirit going to and from a game, a custom sports polo uniform makes for the ideal addition to your team identity. 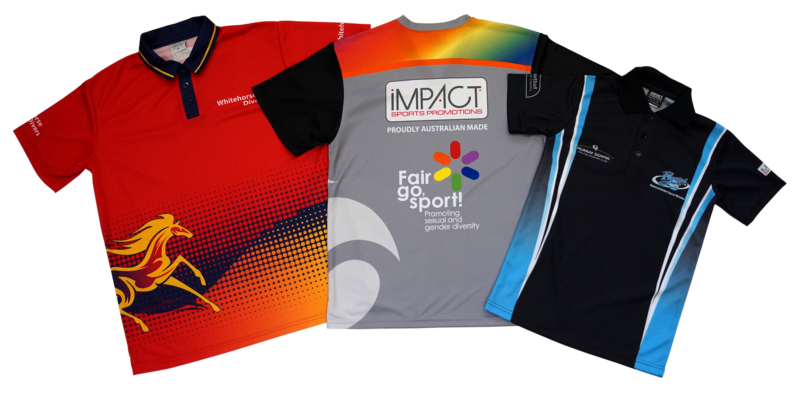 Impact Sports are the premier manufacturer of polo sports shirts in Melbourne for all kinds of teams. With our variety of options for polo and other sports, you will undoubtedly find the right companion piece to your teams’ unique uniform. While it may not seem quite as important as your teams’ on-field uniform, having custom sports shirts in Melbourne for training and leisure wear can boost team morale, let fans show support, and makes for excellent pre-game wear. Here are just a few key benefits to consider when ordering your teams’ custom sports polo attire. Versatile: A custom polo shirt can be worn on the field for training, around the house for leisure, or just when going out in everyday life. There’s no limit to where they can be worn and used and make for the perfect companion on days off. Show Team Pride Off Field: Your team means everything to you, and custom made attire lets you show it. A great conversation starter, these will allow you to show off your team wherever you go. A Range of Design Options: We have a variety of reliable design options, so your team will get a polo- or tee shirt that matches your logo, colours, and can even feature a symbol or image of your mascot. Don’t be afraid to ask what we can do for your team. Why Trust Impact with Your Custom Polo Shirts? Impact Sports have been in the business for almost two decades and have built quite the name for ourselves in that time. Here are just a few reasons why our clients come back repeatedly. Designers On Site: We have designers on site to help you choose and customise your new polo shirts. As such, you will always look extremely professional, even if your team isn’t. Quick, Easy Delivery: As an Australian company, we dispatch our products quickly and get them to you faster than international companies. If you’re in a bind and need shirts promptly, we have you covered. World Class Support: We pride ourselves on customer service and are always happy to work with you. Whatever you need to be done, we will work with you and walk you through our processes to ensure you get the perfect shirts. For customised polo shirts, uniforms, and other apparel, we are the go-to here in Melbourne. To order your new garb, or to learn more about our products, feel free to make contact with us. Working with all sports here in Australia we will surely have what your team needs.